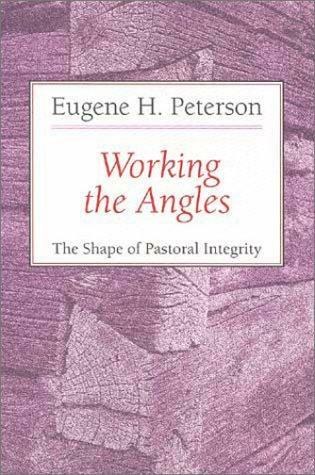 Eugene Peterson gives us a good glimpse into the work and duties of the pastor, in his Working the Angles. Word and Sacrament, in a wreck of a world. How are we to do this? The definition that pastors start out with, given to us in our ordination, is that pastoral work is a ministry of word and sacrament. But in the wreckage what difference can a little water, a piece of bread, a sip of wine make? Yet century after century Christians continue to take certain persons in their communities, set them apart, and say, “We want you to be responsible for saying and acting among us what we believe about God and kingdom and gospel. We believe that the Holy Spirit is among us and within us. We believe that God’s Spirit continues to hover over the chaos of the world’s evil and our sin, shaping a new creation and new creatures. We believe that God is not a spectator in turn amused and alarmed at the wreckage of world history but a participant in it. We believe that everything, especially everything that looks like wreckage, is material that God is using to make a praising life. We believe all this, but we don’t see it. We see, like Ezekiel, dismembered skeletons whitened under a pitiless Babylonian sun. We see a lot of bones that once were laughing and dancing children, of adults who once made love and plans, of believers who once brought their doubts and sang their praises in church – and sinned. We don’t see the dancers or the lovers or the singers – at best we see only fleeting glimpses of them. What we see are bones. Dry bones. We see sin and judgment on the sin. That is what it looks like. It looked that way to Ezekiel; it looks that way to anyone with eyes to see and a brain to think; and it looks that way to us. “But we believe something else. We believe in the coming together of these bones into connected, sinewed, muscled human beings who speak and sing and laugh and work and believe and bless their God. We believe that it happened the way Ezekiel preached it and we believe that it still happens. We believe it happened in Israel and that it happens in the church. We believe that we are part of the happening as we sing our praises, listen believingly to God’s word, receive the new life of Christ in the sacraments. We believe that the most significant thing that happens or can happen is that we are no longer dismembered but are remembered into the resurrection body of Christ. Eugene H. Peterson. Working the Angles: The Shape of Pastoral Integrity (Kindle Locations 217-231). Kindle Edition.